As a teen, I bowed to each member of the nerds’ triumvirate: Rush music, X-Men comics, and Dungeons & Dragons games. For the uninitiated, Dungeons & Dragons is a tabletop role-playing game which has elements of collaborative storytelling and improvisational theater, with oddly shaped dice to settle disputes. In a game, you create a character, through whom you act out adventures in a fantastic scenario. 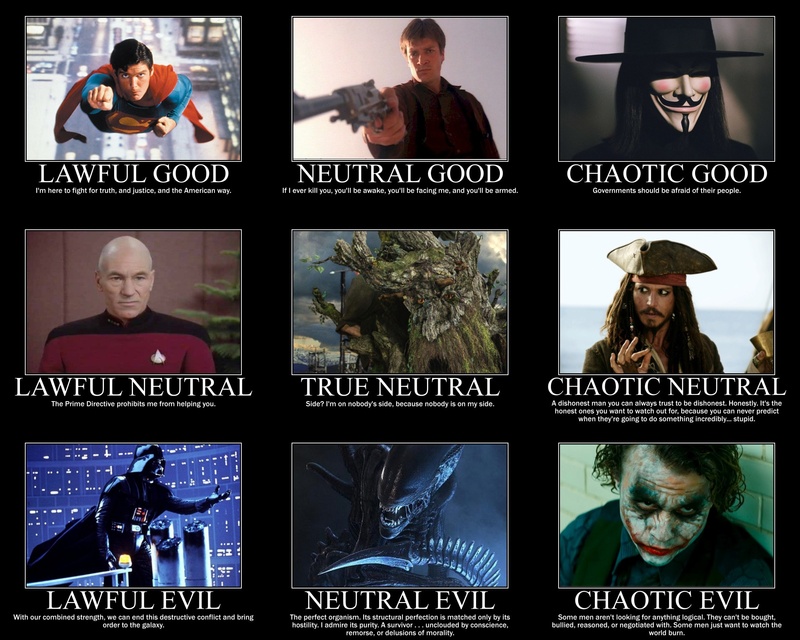 A quirky aspect of character creation was the concept of alignment: each avatar, or character, had an inherent moral code: good or evil, law-abiding or anarchic. You can see a schema here. The black-and-white moral system appealed to my sense of romantic adventure (consider Star Wars). As an adult returning to the hobby, it’s my least favorite aspect of the game. Today, the characters I want to play in stories are morally ambiguous rogues, like Omar Little of the HBO program The Wire, who set their own standards and live by their own sense of rough justice. There’s not much room for that within fixed polarities and moral codes. Like most teens, I had an acute distaste for hypocrisy. But as an adult, I don’t think of inconsistency as any hypocrisy, but as maturity. Messiness is life. Most things don’t fit into neat categories: as Chris Rock would say, I’m liberal on some things, and conservative on others. In fact, the most destructive sort of policies are often those that posit a unambiguous human moral compass. Consider the injunctions against poverty in Deuteronomy: “There shall be no poor among you!” (Deuteronomy 15:4) It’s a noble ideal, but one that admits no trade-offs between equity and productivity, or grasps that debt is a necessary precondition for shared wealth.